Loaded with tart rhubarb and tangy raspberries, sweetened with local apples and rich maple syrup, this fruit crisp celebrates the end of summer harvest. The topping is delightful, made with oats and ground almonds held together with coconut oil (or butter if you prefer) and a touch of sugar and spice. It also happens to be gluten free. But mostly it’s a dessert that I want to repeat as often as possible. 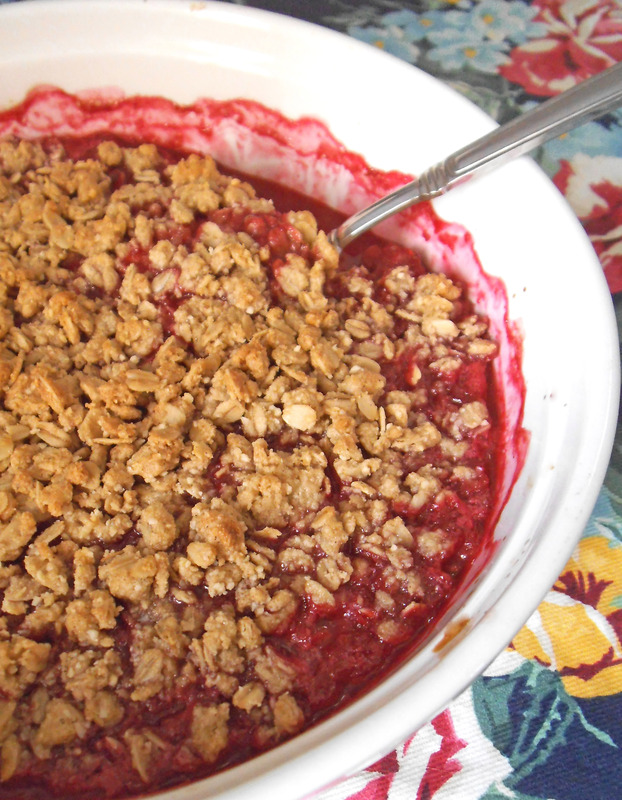 To me it’s fruit crisp at its finest, which I’ll choose over chocolate decadence almost every time. 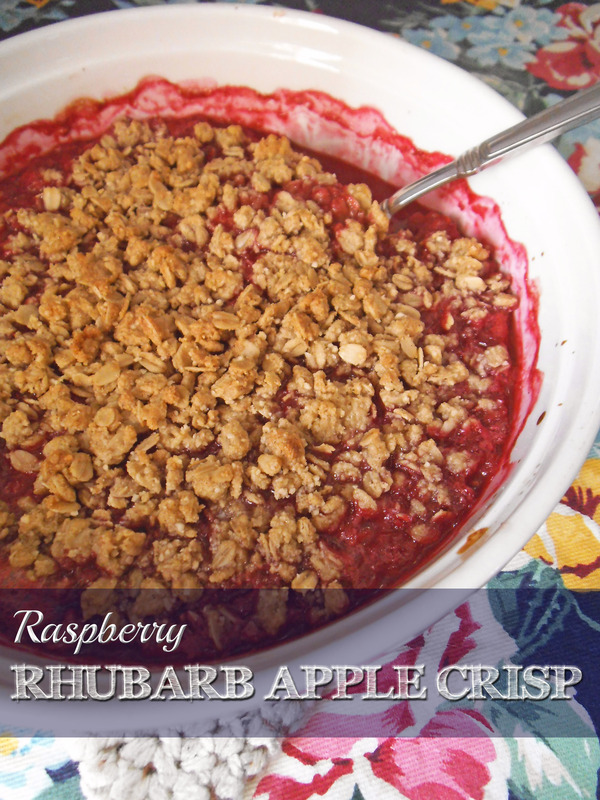 In a large saucepan, bring rhubarb, apple, raspberries, juice and maple syrup to a boil. Reduce heat and simmer for 10 minutes. Remove from heat. Preheat oven to 375 degrees F (190 C). In a separate bowl, blend together oats, oat flour, almond meal, coconut oil, salt, ginger, and cinnamon to form the topping. Pour warm filling into a 2 quart baking dish. Sprinkle with topping. Bake for 25 to 30 minutes or until topping is crisp and golden. Serve warm. Mmm…this looks delicious! It looks like the perfect dessert to transition us from summer to fall, with the berries and apples combined. Beautiful! Thank you! I love that we still have fresh rhubarb up here, but I think frozen rhubarb would work just as well. Enjoy! Oh, rhubarb is so yummy! I wish I could get my hubby to eat it. I’ll bet this is mouth-watering, because mine already is!! Yum! This looks amazing. I’ll be pinning to try later. Crisps are about my favorite category of desserts so yummy, easily healthy, and so yummy. I have never done raspberry rhubarb and apple all together though. Sounds delightful! I definitely want to try this! Thanks for sharing it with us, I will be featuring your recipe this week! Looks delish! 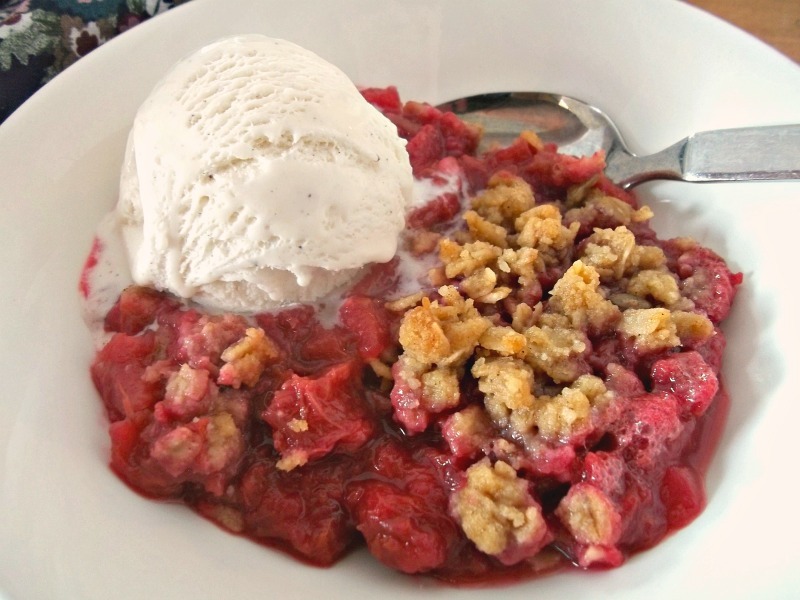 I happen to have a bag of frozen rhubarb in my freezer, so I think I will make this. Wonder what I could use in place of the almond meal, though…we have nut allergies around here. Any thoughts? If you don’t need it to be gluten free, all-purpose wheat flour would do just fine. I think rice flour or teff flour would also work if you are avoiding gluten. I’d be glad to hear how it turns out.